Preheat the over to 350 ° F.
Carefully wash the portobellos and cut off the stems. Place the mushrooms on a plate and brush both sides with balsamic vinegar. Cut the bell peppers up into quarters and lightly toss with olive oil. Roast the pepper slices in the oven on a cookie sheet for 30 minutes. Combine the vegetable broth and garlic in a saute pan. Cook until the garlic is soft but not browned. Add the baby spinach and cook it until it is wilted. Season with salt. Sprinkle pepper on the mushrooms and roast them on a baking sheet for 10 minutes. While the mushrooms are cooking, place the remaining balsamic vinegar in a small saucepan or saute pan. Reduce the liquid over medium heat until the mushrooms are done. 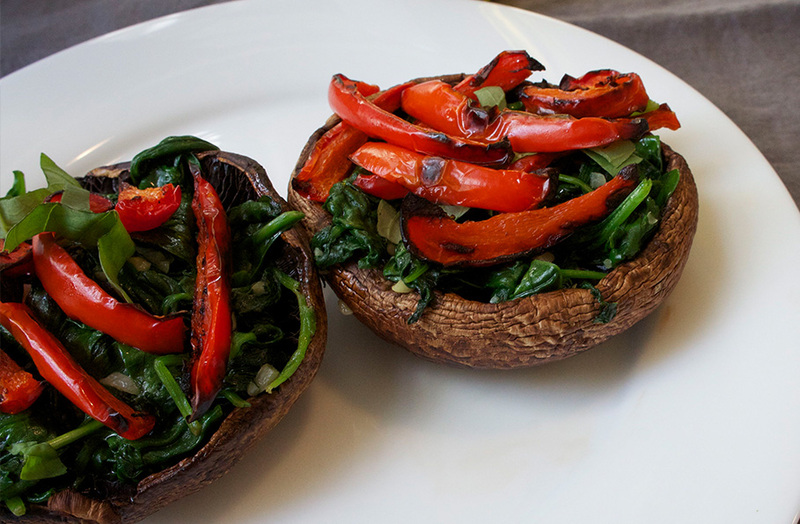 Layer the spinach and then a piece of bell pepper on top of each mushroom, and place them back in the oven for 5 minutes. Remove the mushroom napoleons from the oven. Place them on plates with a spatula, drizzle each one with the balsamic reduction, and sprinkle with the fresh herbs.